30 days :: 14 | Flickr - Photo Sharing! Márcia Abreu, stitchindye, and 18 other people added this photo to their favorites. looks like heaven to me! oh yes, lovely buttons, but those SHEEP!! I love me some buttons. It really is getting out of control. I have enough but can not stop buying them. those sheep are so SWEET! momma and baby, love it! where do you get your ideas/patterns for hand embroidery? Sometimes they come from patterns, new and old books, illustrations, free-form, and of course - children's art! oh man, this is how lame i am (or how often i dig up my embroidery. i have that exact pattern you linked! check it out) i'm such a dork. 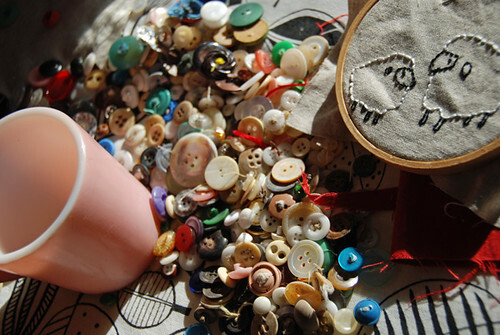 I can never have enough buttons~I love the cup also very pretty. makes me want to dive in and start picking through them to find the prettiest ones. always my favorite thing in childhood, and obviously still a big fave.